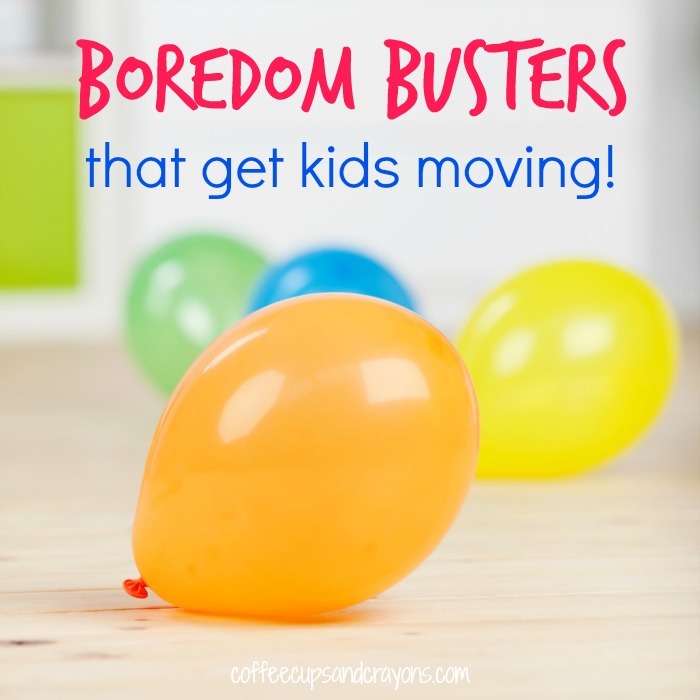 If you are looking for a fun indoor activity then you will love these boredom busters that get kids moving! They are simple to set up and so much fun you’ll want to play no matter what the weather is like outside. Grab a pack of balloons and blow them up. (Better yet if your kids are old enough let them help.) Throw them on the ground and let the kids pop away! You can make it more fun by calling out one color to pop at a time and more challenging by naming a certain body part they have to use to pop with. This is perfect for anyone without a lot of space indoors. Let kids play tag by only walking on their knees or crawling on all fours. It’s fun and silly (even for big kids!) and will keep the crashes to a minimum. Shake off the doldrums with a dance party! Play and stop music for freeze dance or turn off the lights and grab some glow sticks for a fun neon dance party. Older kids can create new moves to master and teach each other and moms and dads can play some of their favorite music from when they were young for even more fun! It’s waaaaaaaay less messy than it sounds and can keep kids busy for quite a long time! Mix up a batch of window paint and let them create a masterpiece on your windows. If you are not brave enough to let them paint then grab some washable window markers next time you are shopping to have on hand. Do you remember playing bombardment in school? It’s like dodge ball except there are two teams that throw many balls at each other. If you get hit you are out, but if you catch it someone on your team can come back in and the thrower is out. Play indoors with crumbled up paper balls to keep your belongings safe. You may not want your kids to jump on the couch but letting them jump on the cushions is a great way to work off some excess energy! Set up cushions and pillows all around the room for the kids to hop on. You can tell them anyone that steps on the floor is out or pretend the floor is a swamp full of alligators and let them create their own pretend play game. YES! Simple and easy are the ones who do around here too! Hope your kiddos are feeling better!